NEW ORLEANS — For the 1st time in almost 4 years, an LSU woman has found herself on The Bowerman Award Watch List. After a few outstanding weeks on the track, the Tigers’ Aleia Hobbs made her debut on The Bowerman Pre-Conference Championship Watch List, as announced by the U.S. Track & Field and Cross Country Coaches Association on Wednesday. Hobbs becomes the first female Tiger since Kimberlyn Duncan graced the list back on May 30, 2013, one year after claiming the award herself. Hobbs had a powerful showing at the inaugural SEC Relays at LSU’s Bernie Moore Track Stadium this past weekend, kicking things off by anchoring the Tigers’ 4×100 relay team to a collegiate record-tying time of 42.12. Shortly thereafter, the New Orleans native ran a 10.85 in the 100 meters, good for 2nd in outdoor collegiate history. While Hobbs was the lone newcomer to The Bowerman Pre-Conference Championship Watch List, another SEC athlete made her return after a few months on the outside looking in. Alabama’s Quanesha Burks returned to the list after a hiatus since early February. It would have been hard-pressed to keep her off any list recognizing the top track & field talent in the country over the past few weeks, as Burks was also spectacular at the SEC Relays. While posting a wind-aided 6.90m (22-7¾) in the long jump for the top spot on the descending order list, the native of Hartselle, Alabama, also anchored the Crimson Tide’s 4×100 relay team that ran the NCAA Division I’s 10th best time on the year at 43.17. The remainder of The Bowerman Pre-Conference Championship Watch List is full of familiar names, including 5 who have been on every watch list since the preseason list was announced on Jan. 4. Oregon’s Raevyn Rogers and Ariana Washington, Georgia’s Kendell Williams and Keturah Orji and Ole Miss’ Raven Saunders have been mainstays on all 6 Bowerman Watch Lists during the 2017 season. Rogers was solid at the Penn Relays last weekend for the Ducks, competing in the 4×400 relay and the sprint medley relay. Both teams won event titles at the prestigious meet, with the 4×400 relay team posting a time of 3:24.72 for the top time in NCAA Division I this year that doubled as the 5th-best mark in collegiate outdoor history. The sprint medley relay team’s time of 3:39.05 bested the nearest competitor by over 5 seconds. Washington also had a big day in Philadelphia, as she teamed up with 3 others for the 3rd-best 4×100 relay time in the country on the season at 42.35. That mark also allowed her to enter the record book once again, as it stands as the 5th-best time in collegiate outdoor history. The other 3 repeat honorees have had a relatively quiet few weeks. Georgia’s Williams has competed in just one meet since the last Bowerman update, running a 13.36 in the 100 hurdles at the Virginia Challenge. Raven Saunders has not competed since late March, while Orji has yet to make her outdoor debut. Oregon, of course, did not have just 2 athletes on the watch list. Deajah Stevens joined her teammates on what was her 3rd-straight watch list appearance after competing in the aforementioned 4×100 relay with Washington and the 4×400 relay and sprint medley relay with Rogers. Kentucky’s Sha’Keela Saunders found herself on her 4th-consecutive watch list after a stellar performance at the SEC Relays. The native of Suffolk, Virginia, notched a 6.79m (22-3½) long jump mark in Baton Rouge, placing her 2nd on this year’s descending order list. Finally, one of the more recent additions to the watch list held her ground with an NCAA-leading performance in The Copper State. Arizona State’s Maggie Ewen posted the 2nd-best hammer throw mark in collegiate outdoor history last weekend at the Duel in the Desert meet that pitted her squad against in-state rival Arizona. Ewen’s toss went 72.81m (238-10), which is just 4 inches short of Jenny Dahlgren’s collegiate outdoor record of 72.94m (239-3) set back in April 2007. Texas’ Chrisann Gordon and New Hampshire’s Elinor Purrier also received votes. 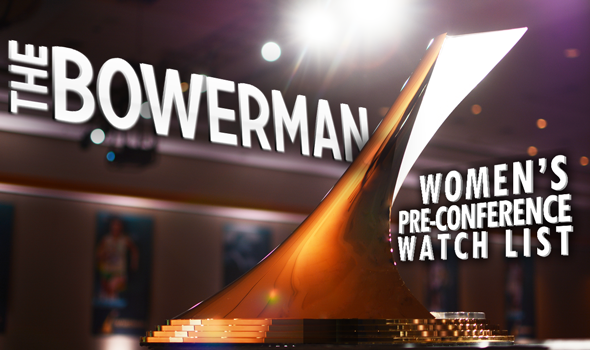 The next women’s Bowerman Watch List will be released on May 17.